Clearly, the capability introduced with VMware vSphere 4 that allows VMware ESX 4 to virtualize itself is a real crowd-pleaser. I asked some super-smart engineers inside VMware about the issue, and of course they know all about it and how to make it work. Do I even need to say that this stuff is not supported by VMware Global Support Services (GSS)? Well, I just did. 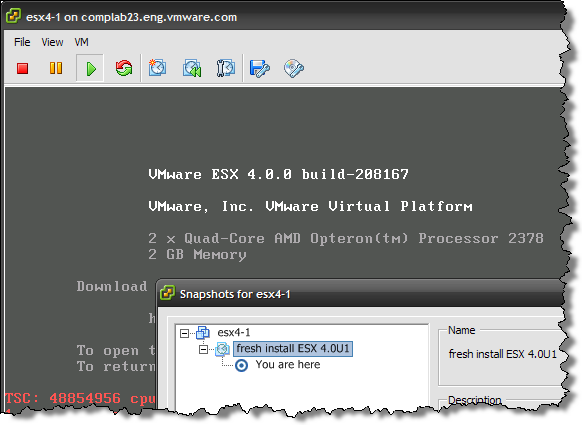 Were you constrained by the lack of virtual ESX snapshots? What interesting things will you use this for? I guess ESXi is also concerned ? Hmm. I have not taken a look at ESXi snapshots in a VM. I suspect that since ESXi does not have the same VMFS architecture as ESX, it might just work as is. This is good to know. But this also brings up a big question on how we use ESX as a VM. When I do it, I don’t use the local datastore of the guest ESX host. I always point to a defined iSCSI resource that is constant, regardless of the host state. Further I maintain snapshots of the guests outside of a virtualized ESX host state. Maybe I go about it differently, but this lets me keep images and VMs constant in spite of what host hopping and chopping I do. I, too am interested on how this applies to ESXi – as most of my nested virtualization does use ESXi. Thanks as always for another good post, Eric. As Eric mentioned, the advanced host configuration does not apply to ESXi. I’ve tried this in the past and saw some interesting results when snapshotting a vESXi host while it was offline. I just tried on a powered on ESXi host and basically took a snapshot while it was on, then created a dummy vSwitch and renamed the datastore. I then reverted the snapshot and only the vSwitch was removed, the renamed datastore persisted even after a revert. I need to do more testing but I think with ESXi, it might not work 100%. I just wanted to share my experience. But with little difference… I’m using Workstation 7 and virtual ESXi as a VM. Snapshots works fine. I keep my snapshot files in the same directory of my individual linked clones. I did a snapshot test with Powered On vESXi 4, and then revert back.. everything worked. Even password change between those 2 snapshots. @Vladan: Does Workstation let you put x64 VMs as a guest on the vESXi server? Or does it have the same hurdle as ESX in this regard. The same trouble on the W7. @Vladan Cool – Thanks for verifying. Saved me some time. not a question about snapshots or ESXi, but what applications do you use that creates the torn edge on the images? This also affects virtual hosts that are moved with storage vmotion. This makes sense as the svmotion process uses snapshots, though I find it curious as I moved the VM when it was powered down. I ended up just reinstalling ESX as I want to keep our hosts in line with support. Actually, it looks like it is the simple fact that the new data store is NFS instead of block iSCSI. 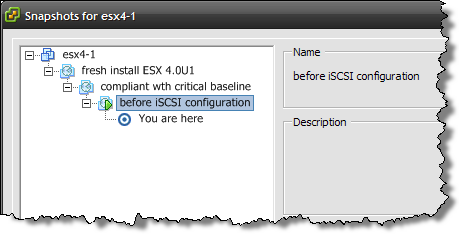 I was unable to reinstall ESX on the NFS VMDK, but I was able to reinstall by creating a new VMDK on iSCSI. Moving the original failed virtual ESX host back to iSCSI resulted in an inability to boot. Is this feature named differently in ESX 4.1 (VMKernel Release Build 235786) ? I was having trouble running a esx 4.0 on a esxi 4.1, it worked previously, but after doing a cold migration to another host it did not work anymore. I’ve found that if you disable ctk ( ctkEnabled=false for both the vm and the scsi devices) going to advanced properties on the vm hosting esx it does work again. thanks a lot for sharing your experience, I confirm that I was able to resolve the boot problem simply changing the ctkEnabled=false for both the vm and the scsi devices, without any action on the physical ESX host. Is there a way to get this working on ESXi 5?